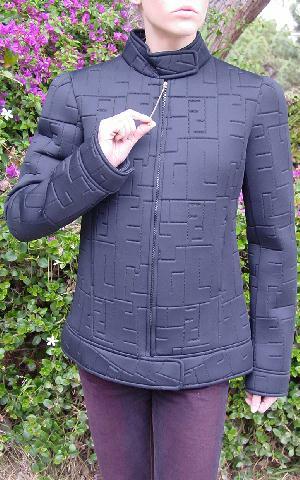 This black Fendi jacket is 45% polyurethane, 35% polyester, and 20% polyamide, with a hot pink lining of 60% acetate and 40% viscose. 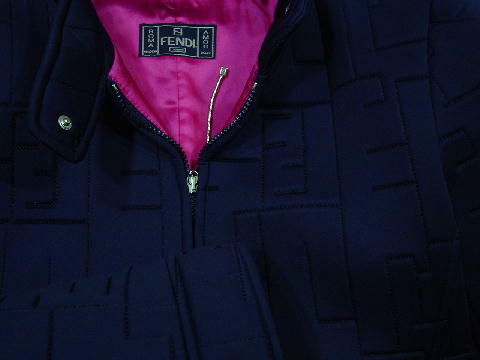 The Fendi double F logo is double stitched over the entire black surface. The front has a top to bottom zipper with a gold-tone 4" long zipper pull with a tiny box at the end with the logo on the front side of it. 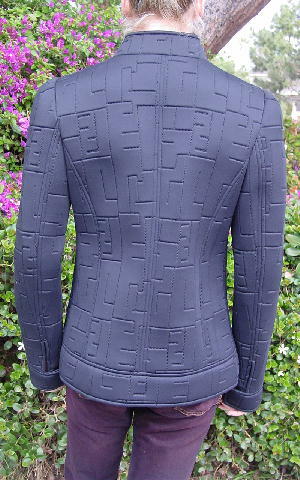 The 2" wide band at the bottom has 2 hidden snaps, and the 2 1/4" wide band collar and cuffs each have 1 snap. All of the gold-tone snaps say Fendi Jeans. It's from a stylist's collection, and was used in a magazine photo shoot with a gray Fendi neoprene short sleeve high neck top and goat hair pants. The stylist said the retail price was listed at $1250.00. shoulder to end of sleeve 27"
side to side at bottom hem 21 1/2"